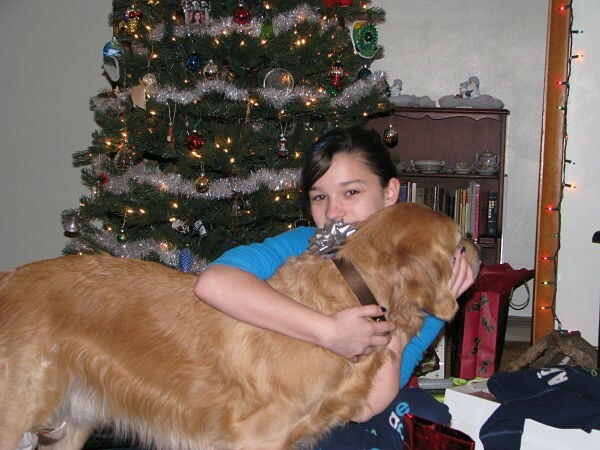 Was thinking about you and your sweetness this Christmas Eve. I'm so glad you made it to church tonight, I wish I would have. Thank you so much for the prayers and for lighting our special candles. You are very much like your Buds.... "Sweetness"
It's me your nephew Hao Sun Chay Buddy...we Double B Boys, Double AA girls and all of our sweet gang send best Christmas Wishes and warm sweet hugs to you this Christmas morning! Thank you for sharing the story about my little earthly cousin Laughing, how my sweet A took such good care of him after the fight with Bowie, taking him to a specialist for the best possible treatment. A, your caring, the surgeon's skills and Laughing's luckiness worked this miracle! Was Laughing good natured about having to wear the collar? I had to wear one for awhile, not long after first coming to mom...my skin on my belly was sensitive then, from an allergy and I learned how to walk backwards with the cone on, very quickly! My mom and sweet cousin Joelee, decorated my cone with the sweetest stickers, and wrote how much they loved me on it...my mom still has my cone...I never liked it very much at all, but you know we kids are very adaptable and we learn how to adjust to many things. Thank you A, for encouraging me to be strong for mom...to help her and be there for her, especially now this Christmas day. I visited mom yesterday, left her a little sign, my golden hair fur in the shape of the S in just the right place where she would see it, it was the first thing she saw on Christmas Eve morning, and she thought of me, her Sweetness and knew I had come to visit! She knew I was around! I also moved in my Aunt Kris's heart and inspired her to have me be with our family for Christmas, in a very special way. My Aunt Kris, she knew the thought for reaching out to mom to give her a very special present from her son, was from me...she told mom she could have never had this thought, on her own by herself. It made my mom cry so much...but it was a release of emotion for mom too, and my gram is very sentimental too, and she cried when my special gift was given to mom. We always opened our presents on Christmas Eve, as Joelee spends Christmas Day with her dad's family, so it has been our tradition for many years now. Dear A, it is true that I have my mom's whole love...like your life, hers is complicated just in a different way, she always had so much peace and joy with me, and she knows that you too, had Bedo for your joy and comfort. He was your first most special Sweet Son...first in your heart that year when he came to be with you...A, we are singing in the choir of angels this morning, Bedo has the sweetest tenor voice. Me, I love to sing too but I am a baritone, Chance is a deep bass singer, Max and Harry are tenors, Lee Lee, Bailey and Sissy sing alto and the double AA girls sing high soprano parts, and Ellie, too...all of the kids in our sweet gang are singing Christmas carols this morning, and we sound pretty good! My grandpa too, who I never met in earthly life is here, playing the organ and singing, he loves to sing with us babies...mom always knew how much I would love my gramp, and gramp too...would love me so much I think he really needed to have me in heaven with him...he has met your wise dad, who helped make the beautiful flower arrangements with his green thumb! Please know A, that we babies seek to comfort our moms and dads and it is our special wish for you to have a peaceful Christmas, filled with our best memories and times together. I loved the sweet picture of you and Bedo in 2003...that was 3 years before I was born...see why I look up to Bedo for special guidance and wisdom it is not just that he is older and has more earthly experience, he is from your culture one of the oldest in the world, filled with many wisdoms that are unfamiliar to us Canadians...we all have so much to learn from each other, good thing we will have an eternity to learn, sing, play and feast together! Please know sweet A, that we are in harmony singing here in heaven, and we are taking care of each other and looking out for moms and dads! Angels can be very mysterious at times, very subtle and also sometimes obvious so our little movements will keep your awareness keen. Thank you A, for mentioning me when you pay your tribute to Bedo...Buddy sweet nephew is honored by this and so very thankful to be part of A's family now...my mom too, she is so thankful for you and our family connection, and for her connection to all of the special moms and dads here, who have gathered at our request. Please know, that Bedo is singing for mom this beautiful Christmas morning...the choir of fur baby angels, and yes, we like to sing Jingle Bells, too! A, we kids love our moms and dads so much...a big part of us wants to come back to earth and celebrate Christmas, but it is right now, for us to be together here at RB...please know we have you in our hearts, this blessed day and always, feel our angel wings today, we are wrapping you up, very securely in our love and warmth...sweet cuddles, kisses and hugs to you my dear Auntie, your bubbly Buddy is going back to choir now...thank you sweet A, for having so much love for us babies, we feel it all the way from earth to heaven every moment! Your Nephew, Bubbly Buddy Boy Chief! Thank you, for thinking of me and my sweet boy, and also for your lovely compliment. I have to confess however, I am not always all that sweet, especially when the grief comes barreling back, kicking and hitting my angry rage button as to why this had to happen to Buds, especially so young. That is why someone like me needs church so much...to put things into proper perspective, to take in the messages of Christmas, the true meanings, which have come through this Christmas more than perhaps, any other preceding ones...amazingly enough. The pastor then talked about the shepherds, tending their sheep, who also experienced an 'interruption', when the Christ child was born...it was the last thing they ever expected to happen to them, as they were quietly tending their sheep. Toward the end of this message, I thought of Buds...how his illness this year, and his death had so devastatingly 'interrupted' my life...torn my life into unrecognizable shreds, only held together by tears and the promise of being reunited with him, one day. The pastor's message, to the new parents with the baby...yes, your little one is going to provide you with many 'interruptions'...but are they not all leading to opportunities, to blessings that they have yet to understand? Would they have chosen not to have a child, in order to save themselves from being interrupted? Of course not...and so, back comes the thought of Buds...why did he have to leave mom so suddenly, this year? Like mom's car accident, mom needed a little shaking up...God has always managed to find a way, however painful...always found a way to put mom back on track, to remember to focus on the most important things in life. Just like Christ was God's sacrifice, Buddy was mine...we cannot take back our mistakes, cannot erase the past but we can ask for forgiveness, forgive ourselves, not be so hard on ourselves or torment ourselves with what might have been. So, wrapped up within this terrible loss, this most painful interruption...there is an opportunity now, a chance for Buddy's mom to do more of the work she was called to do...raise awareness about animal abuse, help others through their painful misunderstood losses, adopt or find homes for more homeless pets, do some much needed outreach...there are always blessings hidden within tragic circumstances...or opportunities that accompany the interruptions and losses that life provides us with. Buddy was my blessing...often I called him my Buddy Blessing while he was here with me...and now, even more so, as my love and admiration continues to blossom and grow for him. Here we are, Sweet One...our first Christmas season apart on this physical plane. Mom has no words to describe how much she misses your sweet presence, baby...mom is so sad inside, for missing you. Christmas will never be the same, without you my sweetest boy, here to share your beautiful self with your earthly family. Mom knows though, that you are happy, sweet son...you are taking good care of your tribe up there - moms is so proud of you! 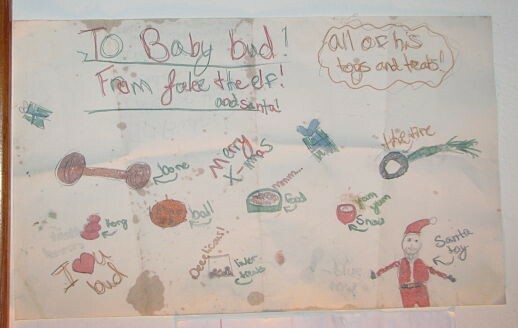 Bud Bud, do you remember the poster that Joelee drew you, for your first Christmas? She was so happy to have you become a part of us, you Buds, the most precious addition to our family, baby...remember the little tire toy she got you, and you pulled the green rope off because we played tug too hard? Baby, you were kinda rough with your toys, but it was only because you got so excited...so worked up and happy to have them! And, you had that special bone, too...and your orange ball with the funny bumps on it, and your Santa Toy? Here's a picture of your poster from Joelee, Buds...she loves you so much! She even drew the snow you loved to chomp on...silly boy! And then, my two tired out Christmas kids, after opening and playing with presents! Bud Bud, mommy never dreamt you would be able to give mom such a sweet special present, for this lonely sad hearted Christmas...but you found a way, my sweet boy. Small miracles are everywhere, especially at Christmas, my loving boy. You found a way to give mom the most beautiful warm lovable present, because you came to Aunt Kris and whispered in her ear, that you wanted mom to have this special card and gift, from you. Aunt Kris told mom she would have never thought of it, on her own...it was definitely all from you, baby...your way of always reminding mom of you, because you wanted mom to be comforted by the warmth and love that you had woven into the fabric of the best gift ever, next to you my Sweetness...mom just loves it, baby, because it comes from you! Mom loves the hand made paw blanket you inspired into being, for mom to have and hold, it is so soft and huggable...every time mom touches it, covers herself with it, wraps up in it...she knows she is right here with you! 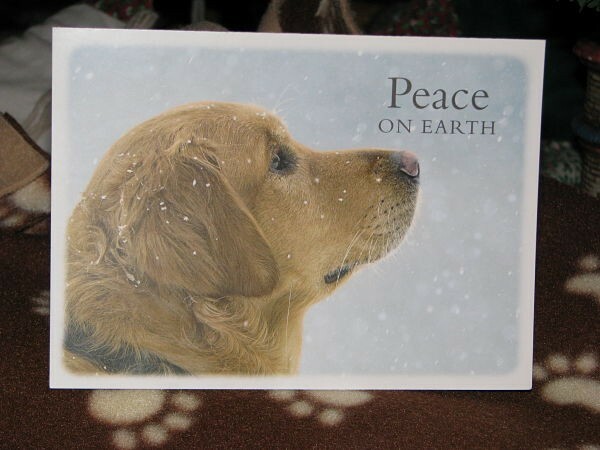 You even picked out the card for Aunt Kris to give with your special blanket gift - it is a picture of one of your sweet breed honey, that looks almost just like you - your noses are almost exactly alike, but the tips of your ears are a bit different! 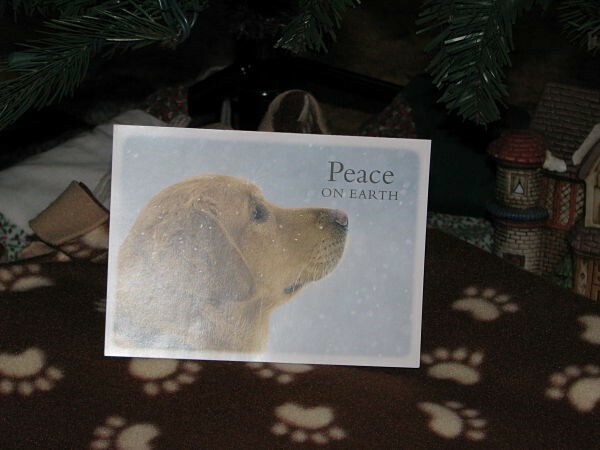 There are snowflakes in the air on this card, that you loved to catch on your tongue so much...it is a beautiful profile picture honey, and this golden cousin even has a brown collar on, just like your favorite one you loved to wear!! Thank you so much baby...you knew how much this Christmas gift from you would make mom cry...every tear belongs to you forever, my Sweetness boy. You have made mom's heart as glad as it could be, you know mom would love if you were here to lay on the blanket with mom, but this is the next best thing my loving Bud Bud...it means the world to mom, just as you do baby...thank you so much for all you have given mom, mom could never express how many gifts you have given mom and continue to give! How beautiful! I was wondering just this morning about Buddy's poster - it is so sweet. Joelee did a great job with it - she had a special bond with your boy didn't she...The beautiful photos of them together clearly show their mutual love and affection - I especially love the close up of them on the floor - Joelee's expression is one of total adoration. Elise, I have trouble finding the words for your gifts - I know how much they must mean to you - Christmas gifts from your sweet baby - what treasures! I am so happy for you - your family's thoughtfulness and support must mean the world to you. The blanket is just beautiful - he sent it so you can feel his sweet love wrapped around you. And that card - it is just perfect - how special it is that Buddy knew just who to "ask" to help him deliver his presents to his beloved Mom. What an absolutely precious boy he is!!! Thank you so much for sharing your Christmas blessings Elise, they make my heart smile for you. I'd love to see the necklace if you are able to share a picture of it sometime. I love that you said "...every tear belongs to you...."
Your pictures with Joelee are Beautiful, they remind us about love for the holidays...two beautiful loving cousins posting warm and loving pictures that would light up anyone's Christmas Spirit in a very peaceful way. Joelee is not only beautiful, but she has a heart of gold and a good artist too..watch out for mom and watch out for her too...make sure that little sweet cousin of yours have a happy and loving life ahead of her...Thank you for the message from mom, and it is so sweet to see you all singing together...A can immagine you big group of sweet behaving Angels playing and singing together in harmony, A can easily picture each of you kid with your cutest gesture! Your grandad playing the piano in Bedo's grandad's garden and A sure there was plenty of goodies sent from our moms and dads for you to all to enjoy, that is so sweet..Baby, how can A not including you, my favour Nephew, a HSC? A's silent night from this Christmas on will be singing to you all Sweet Angels...you all my babies now, will be singing to let you know how much we miss and how much we love you...we are working together to come to our happy ending! A is so happy that you were helping A Chris to pick up such a Buddy's Christmas card for mom, it is so peaceful to look at and it is so You Sweety...The sign from her keyboard was yours too, A knows you wil continue to let mom know that you are around and she does not need anyone's help...she has faith in you baby! 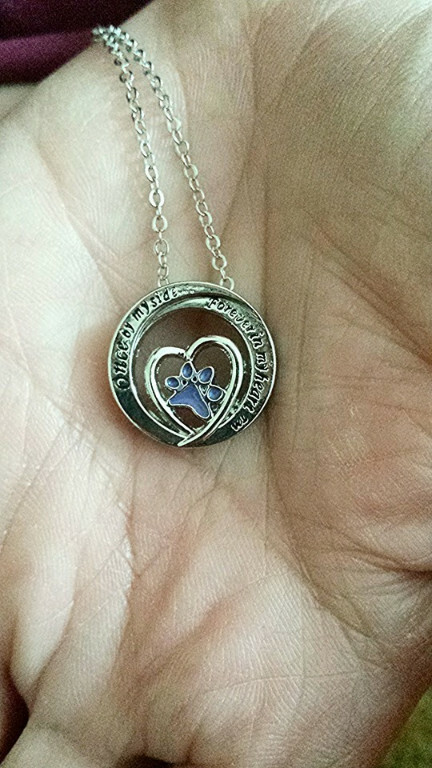 It is such a coincidence, A is going to have a necklace with pawprints just like mom with the same message that A had ordered from Animal rescue website..maybe because of the holidays it has not arrived yet...A knows for sure it will giving mom lots of comfort as she is wearing the reminder of your love in her heart. Oh it was so sweet of you to have cute stickers on your collar...you are a hight maintenant Boy...Laughing is very sweet in his own ways, when his eye got injured..he was afraid A would scold him and he hid himself under the bed...A could put tons of stuff on his body without his complains...he would go to the gate when he is bad...when he is being naughty, A would put on a collar on him and he would just sit there and let A does it and continue to be his oldself without even letting the collar bothering him...A think he is just like his father! Thank you for sharing such beautiful pictures, I know it must be hard to look at them and to feel how beautiful and lovely of the past Christmases could be...We need to honor and carry on these sweet memories for our own earthy survival...we need a constant reminder of love, a life saver for us to hang on..we need to have our babies' old blankets, pawprint necklace, signs...whatever we can have to fill the hollow, to lessen the emptiness that we feel...Wish you a peaceful Christmas day and a peaceful holiday season...and I wish good things will be comming to you in 2014! I will let Joelee know how much you liked her poster that she made for Buddy...yes, she had an incredibly special bond with him. 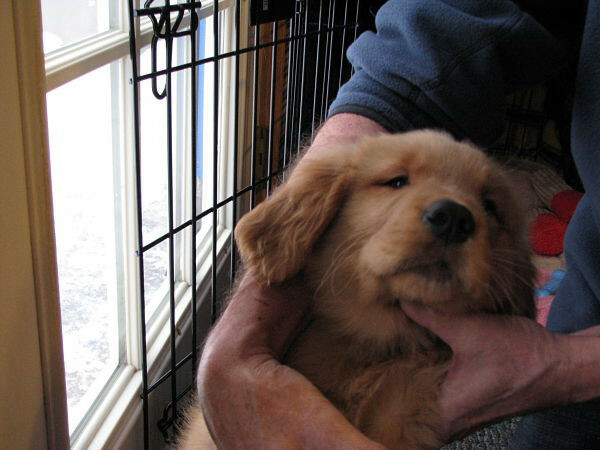 I have a couple of photos (not digital) of when she first met Buds, the first time I brought him to mom's from Canada...the look on her face was absolutely priceless. You can really tell he was a rescue in those early photos, he was so thin, even after being with his foster mom for 2 months. 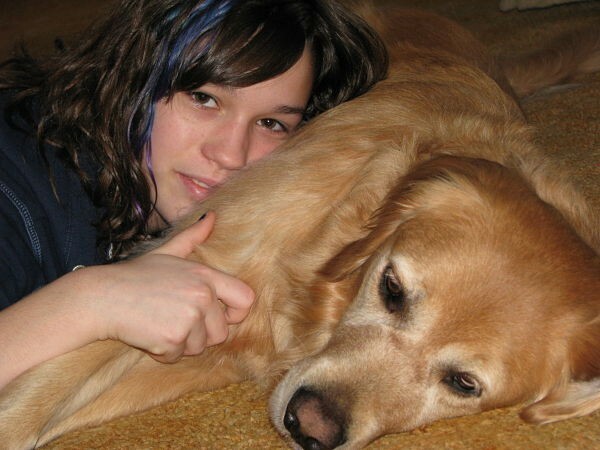 I also have a number of photos of Joelee cuddling with Buddy on the floor like that - she loved hugging him and kissing him, and also having his soft belly for a pillow...he was her very special furry first cousin, for sure! It makes me happy, that my pictures with my sweet little cousin Joelee was a nice warm light for your heart. I am watching over Joelee very closely and mom too...do you know A, that we kids are watching over you and sending you lots of warm comforting love? A, we kids know you never expected holidays to be so emotionally hard as you are having them now, we don't want you to suffer so much! We babies love you so much, you are such a sweet person dear A, please do not get sick...please try to rest and not be worried for the past. Bedo loves that you hold him in your heart so tightly and see his face all the time, but he does not want you to be sad or feel bad about anything that happened before, he knows how much you have always loved him and that your love for him grows stronger, every moment! We babies never want you to lose sight of our happy ending...promise your Big B nephew, that you will look forward to our happiness together? It is so sweet, that you will sing Silent Night for all of us angel babies every Christmas...my mom too, she will be singing for us too, and we will be singing in our new choir too, every Christmas eve and Day. It is true A, that I gave mom a curl of my golden fur on her laptop desk Christmas Eve morning...she knew right away it was me, and the night before nothing was there, she remembers that too. We babies do have our little ways of keeping in touch, letting you know we are never far away. That is so cool, that you and mom will have the same type of remembrance paw necklaces to wear, to keep us that much closer! That is so funny, you say I am "high maintenance boy"...it is so true, I did have my moments keeping mom on her toes, and Bedo too...he could be high maintenance, eh? But I know you loved doing everything you did for sweet Bedo...always a labor of love our moms did for us boys, we know how much you moms love us and this is the part of Christmas that makes us the happiest! Having the love of our sweet moms...we are very lucky Double BB boys...Big Chief and Little Indian...Ho Ho Ho! Please sleep well tonight, sweet A...all of your fur babies are singing you a lullaby tonight, to help you gain your peace and strength. Feel our wings warm around your shoulders...take deep breath in of our love, breath out any pain of the past, let it go...deep breath in, more of our love, breathe out any anxiety, etc...it goes in a cycle of relaxation that will give you the gift of inner peace. Thank you so much, for the well wishes for Christmas and also a Happy New Year. I wish the same for you, and am hoping that our hearts can be a bit lighter as we take comfort in the knowledge that our babies are happy and well, as they wait for us. I always enjoyed taking pictures and videos of Buddy and Joelee...those two were quite a pair! I know he will be so happy to see her again, she always loved his greetings and hugs, he loved giving hugs to his family and friends so much. He also loved to dance with us, up on his hind legs...I'll have to look for some of his dancing pictures, too. I am still in awe, over the beautiful Christmas tree you created with your photos of sweet angel Max, what special memory treasures. Your tree is a wonderful tribute and honor to your beautiful boy. Buds and I appreciate your support and compassion these past few months, it has meant so much, to have kind people such as yourselves who truly care, to turn to. Wishing you every happiness and comfort as we step together, into the new year. If you would, when you talk to beautiful Joelee - please tell her that I'm sorry...she lost someone very dear too and I know that it is very heartbreaking for her. Looking at the photos of her and Buddy take me back many years to my youth and the sweet dogs I loved and lost - it was a different feeling loss for sure, more like losing beloved friend than a baby, but still so, so painful. I looked at your photos in the albums again - I could see in the photos with his foster mom how much thinner he was then. Elise, please, never feel guilty for your gifts and your understanding family - they are blessings for sure - I so enjoy hearing about them. Your Buds has such a wonderful connection with "his" people. I do know Elise just how you miss him - there are truly no words - he is your soulmate - your Sweetness - he loves you very much - so much that he figured out a way to show you! Your necklace is really pretty with the little paw print inside the heart, I just love the words. I know you will enjoy wearing it so much. Thank you for the sweet thoughts for Joelee - I will show her your post, it will mean so much to her. I am staying over with her tonight, I hope we can just curl up by the fire and relax. Joelee has never had a dog of her own, she does have two kitties to keep her company. She also loved my other rescue dog Jemma, who was with me for 15 years. 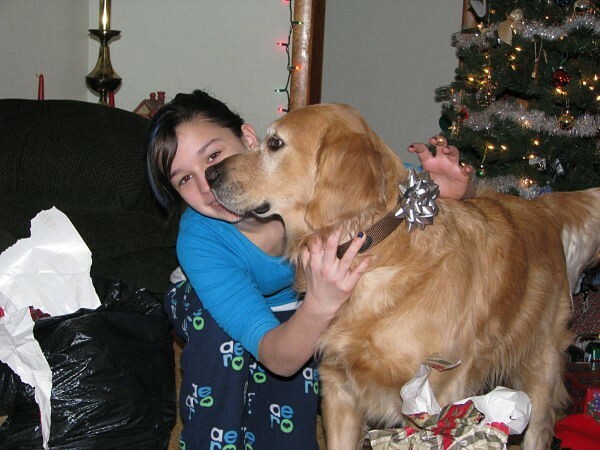 She also loved Jem very much, I have some sweet pictures of her and Jem when she was a little girl...she has always connected strongly with animals, ever since I can remember. Like me, I know she loved Jem very much, but I think losing Buds was much harder emotionally for her. He just had a way of winning hearts...once you looked into those eyes of his, well, it was pretty much over, at least for Joelee and me! Jem was a wonderful part of our family and like you, losing your other dogs in your youth, her loss was very hard, as you say, more like losing a very beloved friend. She gave me many years of companionship, she was a much different spirit than Bud, much more independent, and she never adopted me as her mom in the same way that Buds did. He just needed me, so much more...I never knew what it was like to be a mom, until he came into my life. I was reading a post that Amanda referenced in Butter mom's thread, by Thatcher's mom. She wrote this post, eight years Bridge after losing Thatcher, and although she has had many dogs in her life, many rescues and continues to do this work, Thatcher was her one in a million, her 'heart' dog. I know without a doubt, that Buddy is my heart pup, too. There will never be another, who could take his place in my heart. I will love others, but he has secured his place, forever. And I know, Lee Lee is your heart baby, your soul mate pup forever. It's mommy here...just thinking about you baby, like I always am, and missing you so much! I know you kids are probably resting up today, after all your Christmas celebrations and activities - did you enjoy singing in the angel choir with your other angel pals, sweet boy? Mom and Aunt Kris went for a visit yesterday, with your adopted Aunt Barb and her daughter Bethany...they are getting a new sheltie puppy, because they lost Tippy Canoe just before you left for RB and now Effley is alone and Barb said they are feeding her too much and won't leave her alone because Tippy is gone, so they are all excited to get their new pup on January 11th! Baby, you never had a chance to meet this sweet man, his name is Ralph and he is a volunteer fireman and he loves all dogs, but has a soft spot for golden retrievers. He fell in love with you, when mom was posting on FB keeping people updated on how you were doing when you were sick. 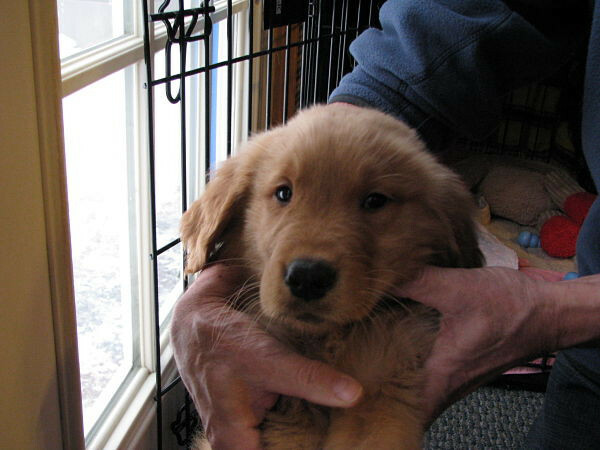 Well, mom didn't meet Ralph and his wife until yesterday - he had let mom know that in addition to his eight year old Jakie boy, he had a new baby eight weeks old named Hogan. He invited mom to meet Hogan, as he thought maybe it would lift mom's spirits to play with a puppy for a little while, so mom went over to his house yesterday and played with Hogan and Jakie. Jakie is a very sweet boy, very much like you baby, only he is a much bigger boy, and his head is shaped differently, but mom noticed that you have some of the same expressions. Ralph had so wanted to meet you, baby...he would have been your adopted Uncle Ralph on earth, and now he is, in spirit. He was fascinated with your head shape, as he had not seen that before and wanted to know about your head and I told him that somebody told mom when mom first adopted you, that you were a "blockhead retriever". We made jokes sometimes, remember baby...calling you Buddy Blockhead!! You weren't offended when mom joked around, you loved your handsome looks so much, it's just that Ralph loved the unique shape of your head for a golden and me too baby, when you first came you were so thin, and your head was even wider looking then, but as you filled out, you started to look in better proportion. Baby, Jakie was so funny...when little Hogan would come to mom for attention, he would nudge in...he didn't want the little one to get any more lovey than he would get! You guys are so comical...all so different but sometimes share similar mannerisms. Curious Hogan, wanting to find a lap! Bud Bud, it was nice for mom to play with these doggies, and to feel Hogan's soft puppy fur...your Aunt Kris couldn't believe how soft he was! Baby, it also made mom sad, too...mom cried when she first saw these doggies yesterday, all she could think of was you, the whole time. Mom wants you to know something, baby, something very important. Mom wants you to know, that no matter how many doggies mom adopts, or spends time with or shares her life with, no pup could ever take your place in mom's heart. You are mom's heart boy Buds...first in mom's heart and mom would not adopt another rescue or have a new baby, unless she knew for sure, that you had a hand in it. Baby, mom loves you and misses you so much. Mom is not ready for a new pup or rescue yet...mom is still very sad for missing you and still has some hard regrets, things mom would definitely change, if she could. Life doesn't seem right anymore...mom is not getting used to not having you right here with mom, honey. 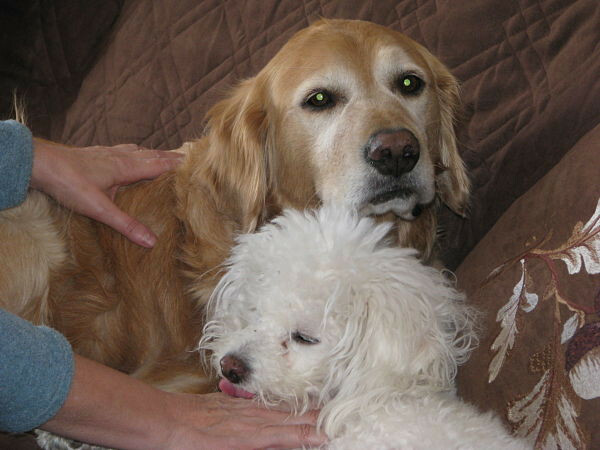 Mom isn't ready for our time together to end...Buddy, please don't ever leave mom, please be close by...mom is wrapping up in your sweet blanket tonight, keeping cozy with your beautiful cousin Joelee in front of the fire. Mom loves you forever and ever baby - thank you so much for reaching out and touching mom's heart so much, this sad lonely Christmas. Please give the other kids lots of hugs, kisses and scratches...take good care of your sweet tribe of fur angel babies honey...mom is so proud of her Golden Chief! If I didn't know any better I'd say you sure LOVE your Buds ;) your stories and memories to him bring me to tears. I know what your feeling and how much you love and miss him. My heart broke earlier when I heard the bell come jingling down the hallway. It's cruel to your heart when something like that happens and your not ready. I don't think there is getting used to that, at least not for me. I went all day without crying, and now I'm sobbing. I miss her so much Elise. I'm glad that you have Joelee with you tonight and are enjoying a warm fire. Little Hogan is so adorable - just an angel. I'm so glad you got to meet him and Jakie and their Dad. I hope your day is peaceful and that you are keeping warm snuggled up in Buddy's blanket with your cherished memories of him in your heart. I'm sorry if my letters to my sweet little man make you cry or sadder than you already are...I am hoping that crying is a good release for you, just to keep letting out your feelings as they come. I started crying today in the car with Kris and Joelee...just going on a few errands around town and out of the blue, here come the tears. It's just become a way of life, now. It was nice, to have that puppy moment with Hogan and family. 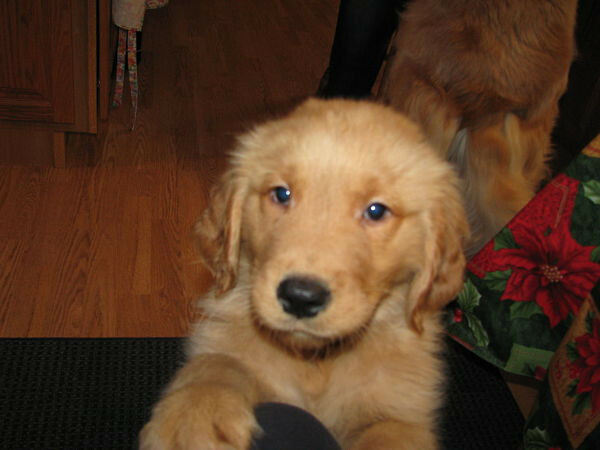 Ralph thinks I should get another pup soon, but I am not ready to bond emotionally with another dog. I know Buddy wouldn't want mom to be lonely, but it is just too soon...there isn't enough of me here to give, right now. I'm glad you took some comfort hearing about the Christmas eve service, and also looking at the pictures with Buds and Joelee. It makes me smile too, when people like you can take some comfort or have a little smile, because of them. Thank you for the compliment for the paw print necklace...like you, it is a little comfort anyway, to have a token of our babies' love so close to our hearts. Jamie, reading your words here on Buddy's thread, over on Melanie's thread, Bedomom's and on your thread for your sweet Patchy...I sense the depth of your sorrow and sadness, so much. What a boat we are all in. I am sorry you feel guilty, petting Link, and that you cannot feel comforted by him. There is no normal to any of this...we just feel what we feel, no apologies. I feel the same way that Melanie feels, and Bedomom who just posted a little while ago...the new year, at least for now holds little joy, as our babies will not be here with us on this earthly plane. For me, I feel like Buds was robbed of his earthly time, and the haunting array of thoughts that I didn't support his health enough, didn't do enough research, might have prevented this from happening...just when I think I'm coming to some sort of peace or terms, it comes roaring back once again and my heart crushes under the weight of these thoughts. I told my sister today, if a doctor said I had a terminal illness, I'd probably just shrug and say, Oh...OK. That probably sounds just awful to say something like that, guess some days are better than others. As you wrote, Jamie, you will miss your baby girl until the day you leave this earth. I know, that it will be the same for me...for so many of us who feel so lost now, without our sweet fur children right here with us. A friend wrote a private message a little while back, said that we do not grieve as if we have no hope. We do have hope for the future...our angel babies wait for us, even in our darkest hours. And they continue to love us, with all of their hearts. You have been specially on my heart this season, sweet A...nephew Big Boy knows you are having a suffering heart Christmas time, thinking about Bedo and everything that happened this year, grieving hard and missing him so much. Sweet A, your intention for Bedo was always the highest and kindest, of any owner Bedo ever had before, you were the one, who blessed his life and gave him his forever loving home, and a sweet mom to have in his heart, always. You were meant to be together God knows this and had a hand in your coming together, and now the test is for you to find the strength to continue in your earthly life, to complete your important life's work. It is so sad that Bedo's first people, they only wanted him for his good looks and did not care about him beyond that. But you did, sweet A! You saved Bedo's life, so many times and yes he was a fighter, very strong spirited and yes, a wise solid rock for his mom, my dear shortie cousin is an inspiration to me and to many of the angels here. Please see the goodness in your heart instead, sweet A...the sorry you feel for people who can't afford to keep their animals, or they keep them but would want to adopt more and because of money they cannot...how many people would think like this, sweet A? How many people would have a concern for those poor hurting souls who want to do more good and because they are not rich or have means, are limited by how much they can do? Not many people would have these concerns, but my sweet A has these concerns, she thinks about tenderness and love and sharing and goodness...she is a model for others to follow, a beautiful example of a person who always tries her best, is devoted and loyal, honors Bedo and works to comfort others who are hurting, and is working on forgiveness of others and herself. Forgiveness is a hard lesson, you humans are tested to forgive throughout earthly life, it is the only path to reconciliation and healing sweet A, to forgive others and yourself...I am talking to my mom too, now...listen up, mom, because you need to hear this, too. We fur babies are lucky because we do not have these hard tests of having to forgive because we never hold judgments in the first place, God made us pure and uncomplicated...we just love our toys, our games our treats and our love from moms and all of our aunts, uncle, cousins and pals, the most. Please never think sweet A, that Bedo does not know or understand how you feel...he does know, and he so very much wants mom to feel better, to take comfort in sweet memories with him and to look forward to our happy ending. You never took little B for granted, all you moms ever did was love us too much...we know we are the Core and yet we want moms to spread more love in this world that needs so much of it, we want our moms to open your hearts because there is room for more sharing and keeping of love, Bedo is always mom's Heart Center but love is infectious and needs to spread to make the most of its essence. Sweet A, Bedo and me we know, how much a part of you is missing right now...your Core before was filled with your earthly life with Bedo, and now must be filled in a different more spiritual way and we know that you moms struggle with this, it is all new to you and the loneliness and longing for us physically, is very natural and human response because you love us so deeply, your love for us could never be measured it goes beyond the depth of any ocean even...even the Universe can not hold it, the boundaries of Universe must expand to keep up with it, it is the driving force for all of Life! We are all your babies now, sweet A...your choir of angels we are holding paws and spreading wings, we are singing with our sweet heaven voices, we have made a Circle of Love around you, this day and every day. This is a big part of our work sweet A, to do this for hurting moms and dads hold them close and centered, in our Circles of Love that's why we are a team of God's loving babies sweet A, we always have this important work to do as we are the constant reminders and ambassadors of love, kindness, compassion and forgiveness. I wish for you, a restful peaceful day dear friend, our feelings have been so hard to take this Christmas, we all need a break, find a way to relax and be easy on ourselves. How are you today? This last very sad day of 2013. It is hard to imagine to start a new year without our angels physically here with us. At the same time I can't imagine it being any sadder then I've already been the last couple months. I know you can relate. You are a very sweet soul Elise. I read your post to Dakota Rose, made me cry. (Not your fault at all, anything can make me) you are very caring and genuinely compassionate. I'll be thinking of you and your sweet Sweetness tonight, you are always in my thoughts. Wishing you much peace tonight, and like Melanie has said, hold tight to your Buddy blanket so that it and the warm presence of your sweet Buds both keep you warm. It's mommy here on New Year's day, 2014. Mom looked down at the floor this morning at the spot where you would always be, right next to mom on your bed where mom could lean over and pet you, hold your paw, say good night I love you Bud so many times...all of the hugs we had together when you would lay on your bed next to mom's...I just miss you so much, baby. Just having you next to mom was always such a comfort for mom, mom always felt so good having you right here with her. 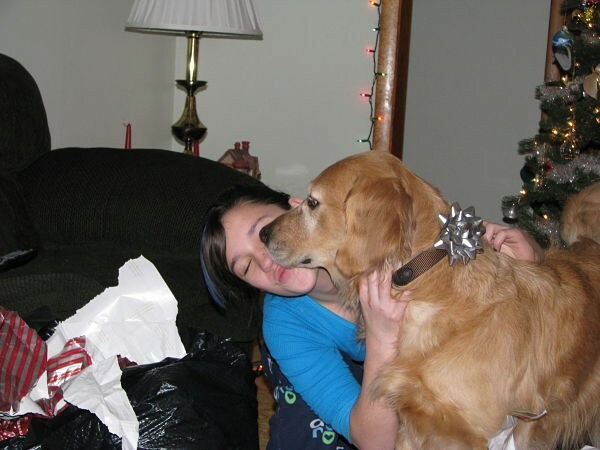 Baby, mom is having a hard time right now facing this new year without you here, physically. Mom knows you are happy being the Golden Chief of your new tribe, baby it is an honor for you mom knows...mom is so proud of you, Bud. You always had so much love for everyone you ever met, you were always mom's Buddy Blessing. We liked to play with the "B" words and your name, didn't we baby? Buddy boy, Buddy blessing, Buddy biscuits, Buddy Butter and so many more mom can't think of right now...remember how you got the butter name, baby? Scared mom so much when we were at the cottage that time! Not long after mom had you, you swiped the butter dish off the counter when mom was out, mom never dreamed you would do that but you did and you ate the entire stick, saran wrap and all! Mom came back and couldn't find the butter dish anywhere...where did it go? Well, you had hid it very well...it was over by the refrigerator on the floor, underneath the little table! Mom was scared because you had eaten the saran wrap, remember mom called the vet and they said just to watch for it passing through and you should be OK. Well you were fine but did you ever give mommy a scare, little man! It was so out of character for you to ever do that, you never got up on counters to swipe things but this was the one time that you did mom can think about it with affection...baby, you just love your butter so much! Thank you so much baby, for being the sweetest most precious son that mom could ever have, you have blessed mom so much sharing your life and love and sweet example of how to be in this world. You continue to be the sweetest Buddy blessing baby, because that is just you, baby...that is who you are and you will always be mom's best Bud boy, forever. A, it is a comfort that Laughing is growing more into his Bedo dads image as he gets a little older...it is Bedo's way of keeping you comforted, he wants you to have this physical part of him in Laughing close by your side. Sweet A, you are so good to mom and the other moms and dads who have come to give and receive here...please know she appreciates it so much and so many others do, too. Never forget you are a wonderful example, and we babies wish for you every happiness and peace for the new year. This is a new beginning, to do more, to love even more...we promise never to leave your sides, sweet A and moms and dads...things unseen are just as real as things seen...it is a test of faith and perseverance, to strengthen character to bear any hardships that may come. Love, happiness and peace for the New Year to you sweet A, and to all the moms and dads who love their babies so much! Somehow Jamie, we have to be strong in the face of such grief and loss and continue on. You have been doing a great job so far, continuing to run and build a successful business, being strong for your boyfriend, your son Jake and even little Link. You rose to the occasion of Christmas as best you could, suffering one of the worst losses you could ever suffer in life, and yet you have held it together...cried when you needed to, reached out for comfort and reached out to help others. It is no wonder Patches adopted you for her special mommy...you adopted each other, and nothing could ever change this miraculous fact. I often think of how our sweet babies found their way to us, and it is nothing short of a miracle. Here you were, pregnant and being told you wouldn't want this kitty as she was the runt, yet something told you to go to her so you did, and your life was changed forever. You discovered more about unconditional love from this little teacher of yours, than you ever would have anywhere else...certainly not in any text books in school! She became one of the most beloved cherished members of your family, your beautiful daughter and princess and she always will be...now and forever. Thank you for your sweet compliment...I felt the urge to write to Dakota Rose's mom...she needed some words of comfort and hope. I know I repeat myself to some extent, when I write to the new hurting souls here, but they haven't heard some of the messages before, and I know how much it meant to me, when people wrote back to me and took the time to write. When I was little, I had the desire to become a missionary. Maybe in a strange way, being a part of this community is my 'missionary' work in the world, or a part of it. I have been trying to figure out my life for awhile now, and I think this new year will bring some more clarity, at least that is my hope and prayer. I'm enjoying getting to "know" your baby through your precious memories - getting a "feel" for his personality. A whole stick of butter .... really? and the saran wrap! Those snow pictures are beautiful - he looks so joyful, his smile is so friendly - happy, happy times. I love that you call him your "snow angel". Who is that handsome guy with the big head in the snow? I am mommy E's Hao Sun Chay! Thank you for bringing the "little girl" out of your good old auntie! No truer words were spoken - what we wouldn't give, for a hug from our babies, right about now? I can still feel his warmth, his sweetness and neediness...he needed so much love...all he ever wanted was to be with me, have his lovey all the time, even more than food. It makes me happy, that you are getting to "know" my baby, and his little personality. That is one thing I love so much about this forum, how we 'get to know' each others' babies...the pictures and stories we tell about them, are precious beyond words. I believe we honor them by sharing them, by sharing who they were in this life, and who they still are, in the life we have to look forward to with them. I know it makes them happy. I know without a doubt, that I will recognize Lee Lee on that Glorious Day...and I will patiently wait my turn, for a hug from her! If nothing else, we are certainly taught patience on this journey of ours...goodness knows! Yes, he woofed down the whole stick of butter and saran wrap...it was amazing he didn't get sick, and after that, he loved having his morning eggs cooked with a little bit of butter...but luckily, he never got hold of another entire stick again! 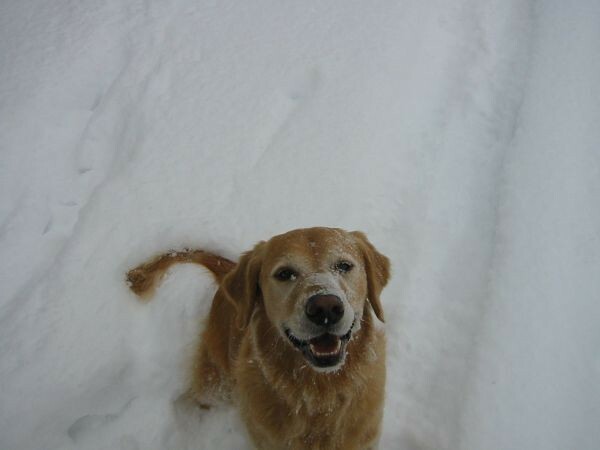 Buds was very happy in that picture with him grinning, from ear to ear...he was very joyful playing in the snow! He absolutely loved winter...and he loved summer also, as he was a water dog and loved to swim and "fish". He is my snow angel, Melanie...your Lee Lee is your heart...my heart belongs to Buds. As Jamie's grandma said, Patches hit the jackpot when Jamie adopted her...didn't we also hit the jackpot, when our babies adopted us? You bet! The pictures of YOUR snow angel are priceless. What a happy happy boy. How proud are you? I know all to well how much you just love and miss him. His pictures are too adorable Elise. Your words are amazing and very comforting. The time you always take to talk and comfort all of us here hurting so much, how you can remember all of our stories, memories, and details. I'm very thankful that my sweet Patches led my heart here to all of you wonderful souls. How sad it is that some of the nicest most amazing people are all in such horrible painful agony missing their angels. I'm the most impatient person I know Elise, like you said about this journey teaching us a lot about patience... I sure hope that I can. My emotions are up and down, it's silly really. I think I went 2 days without crying, then today I cried enough for all week. Jake has a very large personality, always trying to get me to laugh. Just a while ago he came up to me and stretched the skin on my forehead with his fingers, he said " careful Momma, your gonna get wrinkles". Knowing me all too well that his "old" mommy wouldn't stand for that. I wish I still cared about the little things. Patches, to me is worth every single toll my body and heart have taken. Today, Thursday was her "day". I hate Thursdays now but I guess any day doesn't matter because everyday is without her. Her birthday is coming up soon, how sad is that. She may have gotten a little spoiled on her birthday. When was Buddys birthday? We love our babies don't we Elise, we certainly did hit the biggest jackpot when our babies chose us. Patches my sweet precious girl was very much my daughter, my first baby I miss her endlessly and will until the day I die. Hope you are sleeping well snuggling with your Buddy's blanket. It's Bubbly Buddy Boy here! And I have snow on my nose, too! Thank you sweet A, for my beautiful knock knock poem! I am happiest boy in heaven, playing with all the friends I love so much! Some of the southern kids, did not know how much fun snow could be to play in! Thank you for wishing me Happy Snowy New Year! The kids want to snow surf some more, we did some at Bedo's 3 months party yesterday! We at all of the delicious foods, thank you for always giving us the best treats! Sweet A, I love your paw necklace so much. We boys are so proud of you, thank you for giving to those special animal charities in our honor, you are so kind hearted to take care of our furry earth cousins in this meaningful way! Have the best New Year ever, sweet A...we kids are watching over you even during our playtimes and feast times, we are always around in one form or another. Mom found two more of my golden hairs on her laptop desk this morning and now, they have made their way onto her new paw blanket, she was missing my fur on that blanket so now she has some of me on there! 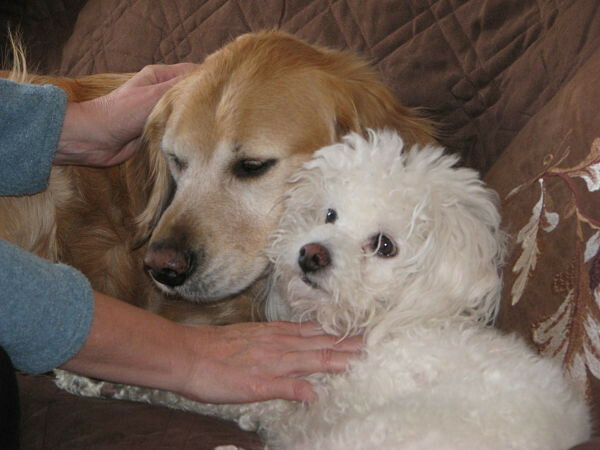 Love you so much sweet A, Bedo and Double AA girls and all of our furry tribe are sending you our sweetest hugs today! Yes, Buds sure did love the snow! I have a couple of videos of him playing with my niece Joelee, behind my mom's house. He was having so much fun with the kids that day! I also have a few of him playing with his friend Katie, whose mom and dad go to Florida every year. I am so glad, that he had last winter at this new house, as he could run free and be outside having fun with his snowballs and pal Katie. Wishing you all the best for the coming year, sweet folks. Your Max is never far...I believe our babies continue to keep a watchful eye out, and maybe they even work with our guardian angels to help keep us safe. I know how much you miss your Max, too. 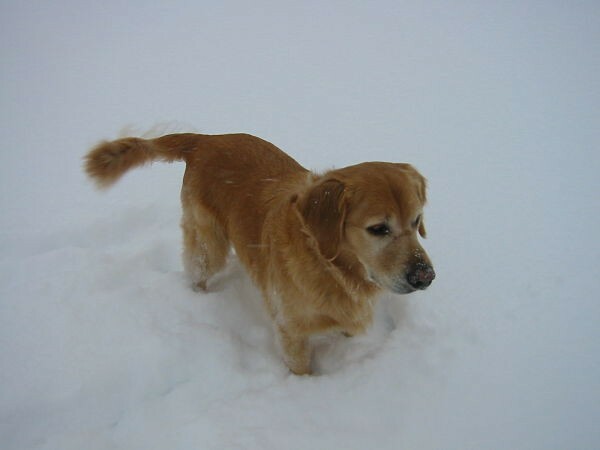 Thank you for the compliment for Buddy's snowy pictures - he was always such a happy boy in the snow...really, any time he was out playing, either with his Frisbees or romping in the woods, etc...he was always mom's grinning boy. Yes, I was always such a proud mom...and now, my heart bursts in so many ways these days...with love, with sadness, with longing...I thought it might get a bit better by now, but it doesn't seem to let up much, other than just keeping busy or distracted, or coming here and trying to give some comfort hopefully, to other hurting pet parents. It makes me sad, knowing that I won't have as much time soon, to spend reaching out to people in need here, but I plan to always maintain a presence on this board. Like Melanie said, I feel that I have made life long friends here, dear friends in sorrow, who have reached out their warm helping hands and hearts...and I will be forever grateful to all of you. I truly do consider you my "heart" pals, because you understand from the depths of your own hearts, exactly who I am and how very real this journey of grief is. I'm so glad that you have your Jake, to lift your spirits...that's cute, how he was teasing you about the wrinkles. It's strange, isn't it...how the 'small' things are insignificant now. I always think of you on Thursdays, knowing how difficult each one is, to come through. I hope that one day, it will be better for all of us here, Jamie. You mentioned that Patchy's birthday is coming up soon - what day is her birthday? As Buds was a rescue, I had no idea when his 'real' birthday is, but we decided to celebrate his birthday on Joelee's day, which is June 27th. So that is the day that became his birthday...we thought it would be sweet for him to share his birthday with his human cousin, who loved him so very much. Baby, winter will never be the same here on earth for mom, without you to play with, mom misses so much, watching you jump for your snowballs, watching you be free in the woods that you loved so much. Honey, I am thinking of you today, having fun in heaven with your pals, doing the snow surfing game and snowball catching game...you loved winter so much, baby...mommy knows...remember how mom would always say that to you, Buds? She would always say "mommy knows" when it came to a lot of things...and you loved the voice mom would use to talk to her special boy with...the voice that will always and only be for you, baby. 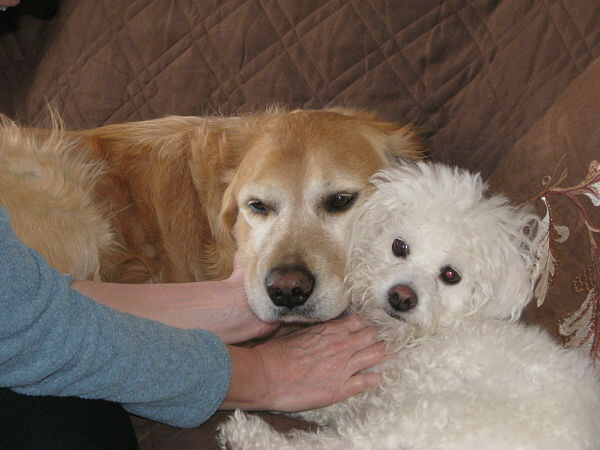 Buds, mom knows you want Katie to be a little comfort to mom because there are no other doggies for mom right now so mom knows, you will try to comfort mom through Katie...she's a sweet kid, and she has been sweet with mom since she came, and it does help. Thinking of you, my beautiful Lamb...this Sunday, tomorrow, the next day and the day after that...not a day or time goes by, that mom doesn't have you first in her mind, and first in her heart. Love you baby, my sweet snowy angel boy...please give all the kids in your big gang up there lots of hugs, kisses and scratches...have fun playing today! I wanted to write earlier to you today after reading your very warm message to me. I've had you in my thoughts this Sunday, you and your adorable little lamb. How cute is he and little Katie together?I feel like when reading your words that I am reading my thoughts and how I feel. get a bit better by now, but it doesn't seem to let up much, other than just keeping busy or distracted, or coming here". Especially the letting up part, its relentless. I'm curios why you wont have much time soon to spend here? I am getting busier to with the business, I ran a New Years campaign and thus far is going overwhelmingly well. But like you, I plan to maintain a presence on this board when I can. I will forever feel grateful for Patches leading me here to all of you sweet ladies. of you and your Buds on Sundays. Sending you warm thoughts and hugs all the way from California. It is all still very fresh and all so very hard for us. But like you said our babies would want us to have more of the better days then bad ones. So we will try. You mentioned feeling bad not having taken more pictures of Buds this last year but I think that the pictures we hold in our hearts and mind are the best ones. The dearest to our hearts. I've seen many amazing pictures of your Buds. Your love for him shines through in every one. she fit in the palm of my hand. It was the end of March...my "free Easter kitten". Best something free I ever got or will ever get again in my life. keep her warm and let her feel safe and loved. I didn't know then how much I would have absolutely fallen in love with her, how much she would have completely impacted and changed my life forever. All I thought walking with her was how cute she was and looking at her little Patch around her eye saying to her, "Look at your cute little face, I think I'll call you Patches...would you like that name"? Had no idea what she would have meant to me or brought to me in my life that day almost 17 years ago.... Feels just like yesterday, now I cant help but cry again. **Was curious if you have started taking those yoga classes we talked about? I am gonna try and start back this week, Yikes!! What adorable photos of Buddy and his little friend Katie - she is so cute - Love her "hair do"- that is too much!! I'm glad you will have her to keep you company for a while - sometimes the warmth of a sweet little soul does the heart good. Give her some special scratches from me please. Your Buddy is such an awesome angel - he obviously is still nearby, keeping watch over you - how wonderful that he leaves his golden reminders about for you to find - I know it must make your heart skip a beat to discover them. To answer your question about spending time here on the forum, I just know that soon, I'll be too busy with the home projects and work, to spend upwards of two hours a day or more, like I have been, on the forum. My marriage is on the rocks - we may be putting this house on the market this year and going our separate ways, which is going to involve a lot of downsizing and dividing of property, etc...it's not going to be pretty. Or, we may keep the house and lead "separate" lives for the next year, but ultimately, our separation is inevitable. The reason for the split? Primarily because of what happened during Buddy's illness...it's a long sad traumatic story, all to say I did not have the loving support of a devoted partner, and had to fight tooth and nail for Buddy's chance at life. What a way to discover someone's true colors. Without a doubt, 2013 was the worst year of my life and I learned the hard way, that my values and outlook toward animals were most "unique" and not shared by the one person who I always thought would feel the same way as myself, when it came to Buddy's welfare and life. Instead, I ended up with an adversary, who wanted him put to sleep because of money, when he still had a chance. How sad, that some miserly hearted people could just throw away a beautiful soul like Buddy, because of money. I would have paid anything...would have mortgaged the house, sold the cars, sold the boats...sold the ATV you name it, if it meant a chance for him to live his life. Anyway, it's too much to go into, and I honestly don't want to burden anyone here, with this sad state of affairs...all to say, I would truly be out of my mind if it weren't for you and my other sweet friends here, who have made my life bearable and filled with more light, than I ever thought it would be, again. Well, guess I'd better stop rambling and get this off to you - I am thinking of you, the young mom to be, walking home protecting and shielding your sweet new baby...what a wonderful thought and memory for you to treasure, forever. Hugs to you Jamie, and to your sweet pretty Patches...have a great week, and best of luck on your New Year's campaign...I am jealous, of your warm weather! Thank you so much...I'm glad you enjoyed the pics of Buds and Katie! Yes, she was a little overdue for the groomer's at that point...these Bichon Frise's need grooming every 5 or 6 weeks. It is nice having her for the winter...she is a sweet kid. At first, it was tough taking her because she made me miss Buds even more...all I could think of was the first time they met, so much interaction and how much fun they always had together...all of the activity and commotion...so much more life in the house with the two of them. How different and sadly quiet now, with just Katie on her own. I know she is feeling a little lost...so, we have a new member in the "feeling lost" club...I will give her some very special 'scratches' from you, guaranteed! Your picture with Miss Katie is so sweet...but your Genuine face just make A cry...A loves that sweet face, looking at you A knows you are such a sweetest boy! You let Katie be the Boss at your own home that is so softie of you, Tofu Boy, maybe you are just like mom too sweet, too generous and too kind that sometimes she has to give in a lot for others! Sweet Boy, your gesture is so much like Bowie, Bedo's son, he is the biggest boy and has the biggest head but he lets everyone bully him, even the two rescued Chihuahua, they are acting like his step mothers, the kind of mother from "Throw Mamma From The Train"...you know what A means. Baby, mom needs you more than ever before, please be with her with your sweet spirit, and give her strength and love to go on. A wants to let her know that all of the aunties here are with her...let Little B, AA Girls, Patches, Lee Lees, Max and all the Angels be with her, let her know that We are Family! Earth life is tough and you angels belong to heaven...you only stayed for your earth contract and God took you back...It is sad when mom thinks of you, misses you, but your pictures and her sweet memories would bring you to life again...A knows you two are blended together for good!. A can tell mom is an honest and straight person, her personalities reflect A a lot...A lives life like and open book when A is happy, the whole world knows, when A is sad, A makes it public to the point that people know more about A's personal life than A does. There is no secret in A's life A feels there is right in A's heart and A just does and says thing in a very open ways..A has heard advice that as a Woman, you need to clever, to say what is appropriate to please your partner...but in A's heart only the truth that will set you free, people can put a gun against A's head, but A just can not say or do anything against A's belief! Sweet Boy, your trip to the RB has changed mom's life drastically....A wishes her all the best...in Chinese culture, there is an old saying "The scariest part of life is when a man has chosen a wrong career, and the woman has chosen a wrong man" yes, we all want a good man but sometimes life does not work out that way...the worst part is the good woman always choose the wrong man...maybe we are too nice...we don't think of ourselves when we fall for someone...a big lesson to learn but it is ok...we can start to love ourselves...yes it is nice to have some one to lean on but when that person is not providing that good shoulder, then it is ok to stand straight just by ourselves...Love can be defined in such a broad term...love for nature, for you beaufiful furbabies and for ourselves...we need to love ourselves in order to love others...A means love ourselves in a way that you don't hurt yourself, be strong, be fair,to yourself but not being selfish...with a strong head, we have the abilities to spread love and especially to you all my beautiful fur babies...A just love you so much Bud, you have such a genuine face, you are so lively in your pictures, your soul is so clear that you touches everyone's heart. Bedo is a wise old man, he is different than you softie...may be A and mom need Bedo's help to be toughter as we are just like you Sweet Boy! A thinks mom feels it too...please come to her dream baby, just like Bedo, let her know what is the right thing to do...she is so hurting that needs your support..yes 2013 is a bad year but 2014 will be better for mom...having been there A knows that mom will feel lonely but she will be ok...tell mom to eat right, do some yoga..have her mind clear and she will be more healthy of course she will look better too...don't let any bad experience effect her negatively, A's life is so simple now, A just want to be healthy, simple and happy A is alone but A is not lonely....A hopes mom will feel the same! All the anties here love mom as she is such a sweet and kind sould...but she needs you the most, you need to give her more signs, more hug in her dream...do that Buddy Boy! A Big Hug to mom and you Sweet Boy!! lots of kisses and hugs to all of A's Babies from The Above! I am sorry Elise, whatever happens just take a good care of yourself...Mentally and Physically, The BB Boys are always be with you to give you Double Strength and Double Tender Loving Care!